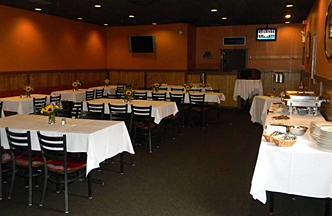 Our function room holds up to 60 people, has its own bar and restroom. Bring your DJ or entertainment and have a memorable birthday, family parties, bereavement, political or business events. We do full catering for our function hall events with plenty of choices. Our buffet menu is also available for takeout. To hold your date we will need a $100.00 non refundable deposit.